Size of this preview: 800 × 522 pixels. Other resolutions: 320 × 209 pixels | 640 × 417 pixels | 1,067 × 696 pixels. English: Photograph taken in Heidelberg, April 1964, by Jeremy J. Shapiro at the Max Weber-Soziologentag. 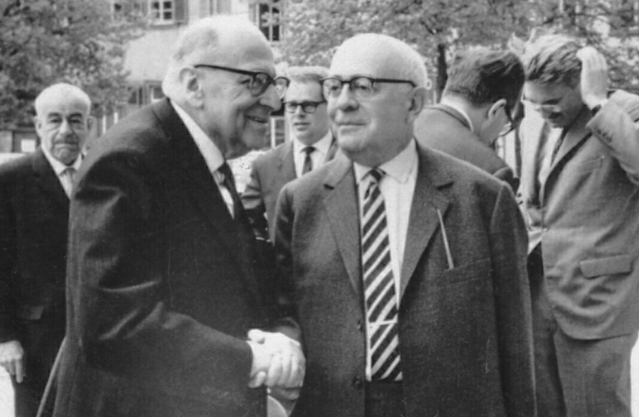 Horkheimer is front left, Adorno front right, and Habermas is in the background, right, running his hand through his hair. Siegfried Landshut is in the background left. 2008-06-14 01:47 Jjshapiro 622×473× (207180 bytes) Photograph taken in April 1964 by Jeremy J. Shapiro at the Max Weber-Soziologentag. Horkheimer is front left, Adorno front right, and Habermas is in the background, right, running his hand through his hair. current 22:36, 31 July 2017 1,067 × 696 (485 KB) Doug4 I adjusted the brightness curve. 01:17, 14 August 2013 1,067 × 696 (535 KB) DHammarberg Higher resolution. 10:35, 20 April 2013 789 × 600 (175 KB) Jonund Higher resolution.